Human Rights organisation Amnesty International withdrew its highest honour, the Ambassador of Conscience Award, from Myanmar’s State Counsellor Aung San Suu Kyi on Monday. “You have chosen to overlook and excuse the brutal oppression and crimes against humanity committed by the military against the Rohingya and against minorities in Kachin and the northern Shan States, and your office has actively shielded the military from international scrutiny and accountability. We have also been appalled to witness your administration spread hate narratives against minorities, fostering rather than challenging discrimination and hostility,” the letter by the Amnesty noted. The organisation is “deeply alarmed” and “disappointed” by Suu Kyi’s “clear and consistent betrayal of the very values” she promoted for decades. “Today, we are profoundly dismayed that you no longer represent a symbol of hope, courage, and the undying defence of human rights. Amnesty International cannot justify your continued status as a recipient of the Ambassador of Conscience award and so with great sadness we are hereby withdrawing it from you. We will publicly announce the withdrawal two days from now, on 13 November,” the Secretary General’s letter to the Nobel Laureate stated. A blog released by Amnesty International highlighted the atrocities meted out against the Rohingyas under Suu Kyi’s regime. “During the campaign of violence unleashed against the Rohingya last year the Myanmar security forces killed thousands, raped women and girls, detained and tortured men and boys, and burned hundreds of homes and villages to the ground. More than 720,000 Rohingya fled to Bangladesh,” according to the human rights group who further mentioned a UN report that calls for the investigation of senior military officials for genocide. The human rights watchdog also criticised Suu Kyi’s administration for failing to repeal repressive laws in the nation, including those that are used to imprison journalists and human rights activists in the nation. The State Counsellor had previously defended a Yangon court verdict on the arrest of the two Reuters journalists who were investigating the Rohingya crisis in the country while speaking at the World Economic Forum on September 13 this year. 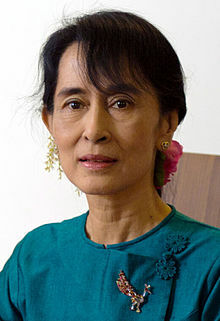 Suu Kyi, a 1991 Nobel Peace Prize recipient, is currently halfway through her term in office during which large-scale violence was unleashed against the Rohingyas in the Rakhine State and a clampdown on freedom of press was witnessed.